Rental touring snowmobiles are a great way to experience winter in Bulgaria. 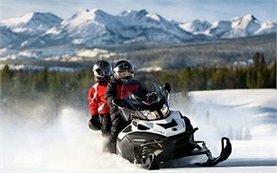 Originally invented to help residents of cold northern areas, to carry passengers and loads, nowadays snowmobiles have became very popular in leisure and recreation. Touring or 2UP snowmobiles are meant to provide two people with a comfortable ride on long distances. With their easy handling and smooth riding they offer excellent performance for a driver and passenger as well. They are heavy and large with longer track length than other types of sleds. 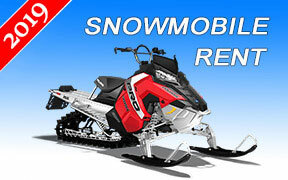 Touring snowmobiles feature electric start, reverse gear, extra tall windshields and side mirrors. Usually they have adjustable and movable backrest, spacious rear rack and non-slippery seats. Some of the most advanced models offer heated seats, communication system and even MP3 player. Best known models of Touring snowmobiles include: Ski-Doo Grand Touring 500 cc, Ski-Doo Grand Touring SE 1200 4-TEC, Yamaha RS Venture GT, Polaris LXT Turbo IQ, Arctic Cat T 570 and Arctic Cat T Z1 Turbo LXR. Two Riders snowmobiles or so-called 2UPs are а great rental choice to enjoy winter outdoors with friends. They feature the most advanced suspension geometry, predictable and easy handling and strong chassis. Their reliable, 4-stroke, fuel-injected engines deliver fuel economy and durability so that the riders enjoy trouble-free riding and great performance. Designed for long hour riding, 2UP snowmobiles have comfortable seats made from non-slippery material, extra tall windshields for better protection and heated handlebars. 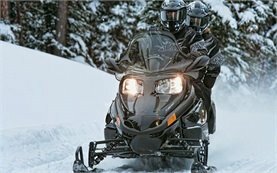 Most of them provide additional comfort for snowmobilers due to their adjustable backseats, spacious cargo storage and even heated driver’s visor power outlet. The most popular two riders snowmobiles include Yamaha RS Venture GT, Yamaha Venture Lite, Yamaha RS Viking Professional, Polaris Turbo IQ LXT, Sci-Doo GTSE 1200 4-TEC and Sci-Doo Grand Touring Sport.